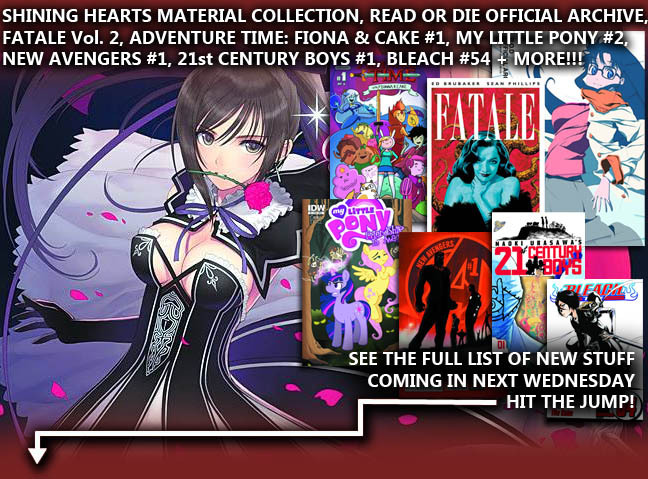 LABYRINTH BOOKS Toronto Comics MANGA and GRAPHIC NOVELS - TORONTO: NEW BOOKS ARRIVING NEXT WEDNESDAY, JAN 2nd 2013!!! NEW BOOKS ARRIVING NEXT WEDNESDAY, JAN 2nd 2013!!! - R.O.D. (Read or Die/Read or Dream) fans can get their hands on a superb artbook coming in this week featuring character designs, promo art, rough sketches and more from the OVAs and TV series! - Now published by Udon, fans of Tony Taka's characters from the Shining videogames can enjoy lots of lovely visual materials in the Shining Hearts Visual Materials Collection that will be available this Wednesday for a great price! - Also this week we will have one comprehensive books on master illustrator and incredible artist Wally Wood! 'WOODWORK' will be available this week! - The hit sensation Adventure Time continues to reach even mroe insane levels of demand that surely won't be helped with the arrivial of a new spin-off series 'FIONNA & CAKE'! Grab issue #1 this week before it sells out as fast as every other Adventure Time comic! - Hot off from the events leading up to Amazing Spider-Man #700 was the vampire Morbius, escaping from the pages of Spider-Man into his own series! Join Dr. Michael Morbius on his journey for redemption in 'Morbius the Living Vampire #1' on our store shelf this Wednesday! - The magical colorful talking horses are back in issue #2 of My Little Pony: Friendship is Magic! Queen Chrysalis has returned! Oh No! - The Black Panther, Iron Man, Dr. Strange, Black Bolt, Mister Fantastic, Namor and Beast are assembling to collide with and infinite legion of parallel universes in the first issue of New Avengers! - Fans of Naoki Urasawa's 20th Century Boys will want to rush out this week to get their hands on the first concluding book that will finally resolve the mystery at the heart of the matter: the identity of 'the Friend'! It all starts happening in the first volume of what is called 21st CENTURY BOYS! - Finally collecting the second arc of Ed Brubaker's hit series, FATALE Volume 2 hits store shelves giving fans all the info they need to then hop onto issue #11 that also releases this week!